At any doctor, as you may expect, you’ll go in and hand them your clinic card (assuming you’ve made one; if it’s your first visit you’ll have to fill in a form with personal information and health history, so helps to have a Japanese speaker/reader/writer with you if you aren’t at a clinic that is fine with English answers and has the questions listed in English) and health insurance card. You’ll also hand them the coupon book (in which you should fill out the individual coupons beforehand with your name/address/birthdate/etc.). The coupon book, or 妊娠健康診査受診票 (にんしんけんこうしんさじゅしんひょう, ninshin kenkou shinsa jushin hyou) is what you receive from your city hall or city health center when you register the pregnancy. The receptionist will take the appropriate coupon corresponding to that week, which usually means the visit is either free or costs very little. (I should note that some of the coupons may correspond directly to ultrasounds or blood tests, while the rest are for visits, so they may take more than one coupon at a time). We also usually hand them our “Maternal and Child Health Handbook” or 母子健康手帳 (ぼしけんこうてちょう, boshi kenkou techou, or often referred to as “boshi techo”), and they give the handbook to my doctor to fill in the appropriate information, such as my test results and measurements. At my current doctor, after we finish at the front desk, I have to go use the restroom, write my name and the date on a paper cup (located in the bathroom), do my business, cover the cup with a tissue and carry it back to the reception desk (while trying not to trip over any scurrying children in the lobby area). When I first did this I had no idea you could or should cover the cup with a tissue. It’s not like I had walked across a lobby before carrying a cup of urine... I'm sure that didn't look strange or anything. After that I noticed women carrying theirs with a tissue over the top, so I followed suit at the next appointment. So if you find yourself in a similar position, use a tissue! At my current doctor, after I’ve delivered my cup to reception, I have to sit and wait until a nurse calls me into the doctor’s office, where they take my blood pressure and check my weight. At a previous doctor, they had automatic machines for these functions, so I had to sit at the blood pressure machine, press the start button, press the print button with my info, and then do the same thing at the weight machine. These little papers were then placed underneath my urine sample cup in the window (so, at that doctor I actually did these right after reception and before Step 2 above). At this time, for both clinics, I’m usually in an exam room where the doctor measures around my abdomen and from top to bottom in the front. In the early weeks, I had to sit in the fun stirrup chair for a vaginal ultrasound of my uterus. After the first trimester they moved to doing the ultrasound on my abdomen. 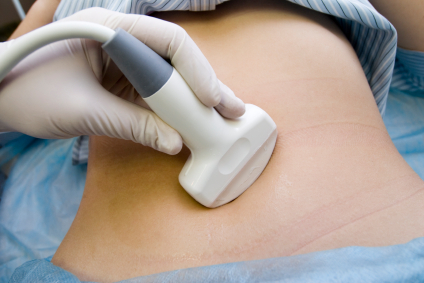 Both doctors perform an ultrasound at every visit, and both also use 4D technology in addition to regular 2D. From what I’m aware of, an ultrasound at every visit is pretty standard in Japan (but if you’ve had a different experience, let us know in the comments). The doctor takes measurements of the baby’s head (at every visit for us), heart, abdomen, leg length (every few visits), etc., while doing the ultrasound. My current doctor has different size kewpie dolls to show us how big the baby is at each visit and always gives us a giant piece of paper with an illustrated baby in utero that is the approximate “actual size” of our baby that week. The doctor also uses the measurements to estimate the baby’s current weight and what he thinks it will be at birth. Both doctors have printed out ultrasound pictures for us to take home every time and put in a little ultrasound picture book. I should also note that, at my current doctor, they take me in to the office by myself first, have me lay down on the exam table, pull down my pants partially and cover me with a blanket (I’m always so hot so I don’t particularly enjoy that) and then call my husband in for the ultrasound. At our previous doctor, they had my husband come in with me for the whole thing when it was an abdominal ultrasound, but when it was a vaginal ultrasound, they didn’t call him in until after I’d taken off my pants, climbed onto the chair, and had the thing shoved in. I always find it funny, since it’s my husband after all and nothing he hasn’t seen before, but that’s just what they seem to do. Is it the same everywhere? That I’m not sure, but I would imagine it’s pretty similar. We don’t see too many accompanying spouses at doctor visits in general, so my assumption is that women often go by themselves, and occasionally bring their husbands for ultrasounds. 6. Discussion, Blood Test, etc. After the ultrasound, they’ll usually bring my husband back in (they make him leave so I can pull my pants back on), and we go over results with the doctor, although lately the doctor has just been going over them with me alone. This is also the point where we ask questions if we have any, or where we’re sent to discuss something with the clinic’s midwife or a nurse, or when I go to have my blood drawn. After 36 weeks, I also have had to go climb in the stirrup chair so the doctor can check the position of the baby and see if baby is descending or not. I have only been scheduled to have 2 blood tests throughout my entire pregnancy (and there were 2 coupons in our coupon book for blood tests). One was in early pregnancy and I had the last one just a couple weeks ago (third trimester). (I’ll write a separate post about the blood tests/other tests). As for other discussions, we’ve talked to one of the nurses about the paying process and deposit for me to be admitted to their clinic for the birth, and we’ve also discussed our birth plan with the midwife rather than the doctor (the head midwife at this clinic oversees most of the labor and the doctor shows up for the birth part). This will likely vary depending on what clinic or hospital you go to, of course. Some clinics, midwives or doctors may do more or less. 7. Pay, Schedule Next Appointment, etc. After all that we go back to the lobby to wait until we’re called to reception again to pay if necessary and set up our next appointment. At this point in time, we’re visiting the doctor once a week, and you can bet I’ll be so happy when we don’t have to go to the doctor all the time anymore! If you’ve gone through the pregnancy process in Japan, feel free to share your experiences with us, or if you’ve written about it on your blog, include the link in the comments below and I’ll add them to the Pregnant in Japan: Resources post.